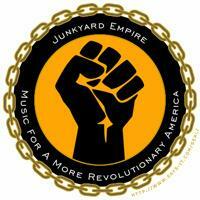 The band Junkyard Empire does not differentiate among music, message and life. Lead vocalist/rapper Brian Lozenski, whose stage name is MC Brihanu says, “Music and art should represent life. My life revolves around social justice and trying to make a better world for my children. Therefore my music reflects that. I don’t think every piece of art and music needs to be explicitly political, but there needs to be an accurate reflection of people’s lives. Most of the mainstream music we hear today is purposefully not political. That is a political act in itself because corporate media does not want its consumers to think critically and challenge the status quo.” They are a band endorsed by Noam Chomsky. “I originally proposed the name ‘Refuse Empire’ which was clearly anti-imperialist, but also an ecological statement. The US is an empire of refuse, since the American Empire is based on everything being expendable, quick, throwaway … including capitalism itself, which never leads to long-term good, it only leads to short-term ‘good,’ and that’s a short-term good only for a small group of people. So building an empire on junk is not good for anyone for the long term.” The name then morphed into Junkyard Empire from there. Brihanu began his activism as a student at Cornell University where he pushed for fair housing and culturally diverse programs. He has been involved in the campaign for the release of Mumia Abu Jamal and other political prisoners, in anti-poverty initiatives and in the demand for education rights. The list of organizations he associates with range from the Uhuru Movement to Wellstone Action to The League of Pissed Off Voters. He believes that activism is integral to his life. Even as a public school teacher he tried to engage his students in thinking critically about society. The state of political consciousness in the United States today is a joke, and civic participation in activism pales in comparison to that during the Vietnam era. In the wake of President Obama’s recent announcement to send 30,000 more troops to Afghanistan people are feeling more powerless and demoralized than ever. It is in this environment that Cox, Brihanu, guitarist Bryan Berry, bass guitarist Dan Choma and drummer Graham O’Brian have created a combination of activism and art. The day after Obama’s announcement, Cox and Berry were arrested in Minneapolis while protesting the escalation. To ensure their survival and success, musicians in the US keep away from the contentious issue of politics. They are rewarded by the corporate-dominated media with excessive publicity and, as a consequence, higher sales. In such an atmosphere, bands like Junkyard Empire are unlikely to find any of their songs reaching the number one position on the charts. Nor do they hanker for that brand of popularity. They do want to reach people, but through different routes and for very different reasons. It is not indifference to public taste, but rather an examined intent to sensitize the public that guides the band. The band’s conviction is both refreshing and unmistakable. Junkyard Empire believes that their music can assist in fomenting the change they feel must happen in the world right now. For them, it is important to combine music, art and politics because they see music as an inspirational mechanism to create change. Today he hopes their band might have the same effect on people. Junkyard Empire is sporadically touring the Midwest, looking to partner up with other radical bands for a larger tour, and working towards a tour of Europe. They are also in the planning stages for other international political actions, and are promoting Rebellion Politik, which is their third album. Bhaswati Sengupta contributed to this report.